← Animal Crossing… for N64? Today’s highlight… SSBB’s very own Green Alloy! If you haven’t seen or heard of him (or her), then you most likely haven’t purchased Super Smash Bros. Brawl. But don’t worry! Whether you are a Brawl veteran or not, we are here to give you a little more insight on these rather unique green Humanoids. 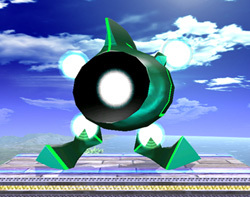 Fighting alloys appear in the “multi-Man Brawl” section of Super Smash Bros. Brawl. There are four Color alloys in total (red, blue, yellow, green), but this one stands out from the crowd. With the ability to hover like Kirby, and equipped with punching prowess, this guy can repeatedly and rapidly raise your damage percentage. After playing through the 100-man brawl (one of the any options for multi-man brawl) with every character, I noticed this guy was the one that usually caused me to start the challenge over again. 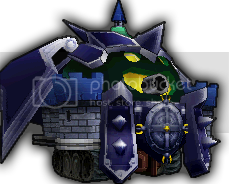 While barraged with a kirby-like combo of punches, you are unable to move, making you a perfect target for the approaching enemy alloys. Hand-down, this is the most annoying Alloy of the team. The green alloy is not the strongest, but their presence is crucial to your demise. All in all, avoid getting into this weirdo’s way. And remember, knock this guy off the stage whenever you can! Posted on July 18, 2008, in character highlight and tagged brawl, green alloy, multi-man-brawl, ssbb. Bookmark the permalink. 1 Comment.